As I explained in today’s Open Thread, there is nothing Democratic Senators can do to block the confirmation of Jeff Sessions (R-KKK) as Attorney General and head of the renamed Department of Injustice. Democrats changed the Senate Rules in 2013 to require only a simple majority to confirm cabinet appointees and judges (except SCOTUS), because Republicans were blocking them all. 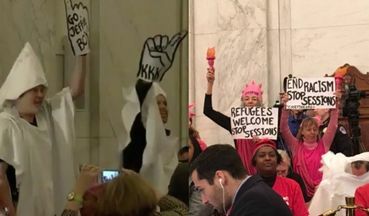 However, at least some brave protestors disrupted Sessions’ confirmation hearing. "This is the acid test. If Senate Republicans confirm Sessions, they won’t stand up to the Fuhrer over anything else." Limiting the minority to 4 testifying is horrible--kudos to Lewis and Booker for honoring their oaths of office and may they persuade all committee members to follow their example. PS--I give kudos to HELP for delaying DeVos hearings to 1/17 to get full ethics info. first. If they don't STOP the appointees of Drumpfenfarten's, we are in for a hard four years and a fitful election in 2018! i may have to start praying! Noted, forwarded,and shared ultra-liberally across four networks!! You know-I often feel like a robot lol!! Many thanks for sharing, Tomcat!!! Sorry, but Drumpf voters think it's quite normal to pick a man like Sessions for the Department od Injustice. In the next four years they won't notice much difference with how was before anyway, but members of a minority, any minority, will feel the brunt of it. But then they didn't vote for him, did they. Resist every day because it won't be over for four very long years. Many kudos to the protestors! Sessions will be approved because most of congress is made up of bastards. I am glad there were protestors! I have signed a dozen petitions to the Senate asking them not to confirm him. I know they will, though. Glad to see the Repubs BLOCKING TRUMP TOO! LOVED IT WHEN CHUCK SCHUMER PUT IT RIGHT BACK INTO TURTLE MAN'S FACE THIS IS WHAT YOU GO BY, it was the paper he used when Obama was elected and taking office. RESIST RESIST RESIST IT ALL. Obamo gave a Great Speech and I hope TRUMP LIstened to it! Much applied to him. I liked when he said you never know about another person unless you climb into his skin and walk around in it. We had Immigrants come to america and that's why America has grown and became what it is..
DON'T THINK TRUMP WILL EVER DO THIS. It's so unfortunate that he will be confirmed regardless. But, wow, he sure is a lying piece of work and a total dork. He fits well with the crew of scumbags he will be joining. What ma peep, Michel, said....in spades. What all ma peeps said actually. He'll be CONfirmed. Doubt it won't go through. And so it begins . . . . . . .
One thing we can all be sure of is that the political reptile of "Republicus spineless rightwingus oportunistas" will hang on to power to the last thread, regardless of the damage they cause to the country and it's people. Just remember mid terms and RESIST!!!!! Obama will go down in history as one of the best ever presidents - I hope Trump just goes down. Thanks, hugs, stars and amen to all. If some would just check things out before they speak! I agree Peggy .We all can check with our computers! "If Senate Republicans confirm Sessions, they won’t stand up to the Fuhrer over anything else." I read earlier today that Sessions said he would have no trouble standing up to Trump if he did something wrong or unconstitutional. So who is going to be the gate keeper on this one? I don't believe it for a second. It will be interesting to see if Republicans try to close the gallery to observers other than the media, members of Congress, and the legal beagles for the remainder of the hearings. Do you suppose that the idiots who voted for this abomination are happy with him now? Thabnks too akk butr one. Is the friendless one another paid troll, or is it jusat a mental health matter?